The head cook (for in the mid 1970's we had few "Chef's" as that was far too French and suggestive of "haute cuisine") had agreed to take me under her wing and teach me how to prepare the only famous dish to come from England and clogged the arteries of its working classes: The Great British Breakfast. They recruit the top students from the best universities, promote them quickly, reward them lavishly and label them as talent. Talent is often misunderstood. Business leaders are obsessed with finding it, keeping it and banking their succession on it. Let me clarify, I am not anti-talent. I believe that we should seek our talent and we should put it to work. 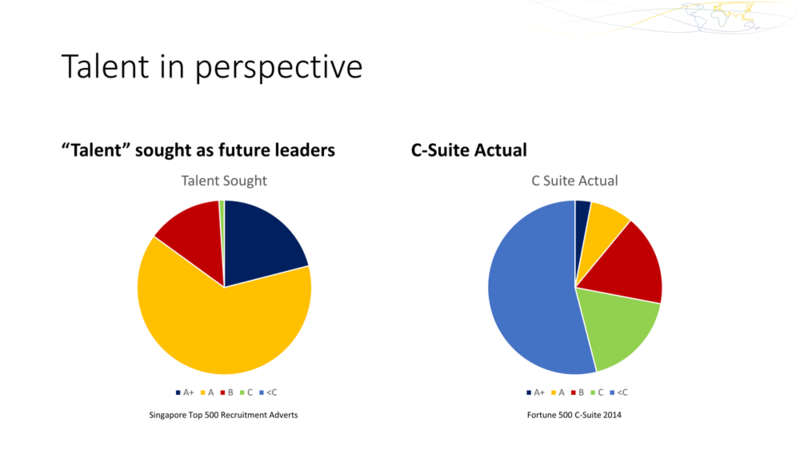 But talent alone is not the answer to leadership succession, productivity and a growing economy. I was 15 years old as I crouched behind that deep fat fryer and about to discover my talent but first I had to serve my time and observe Mrs Brown at her work as closely as possible whilst simultaneously keeping out of the way of her sharp knives and even sharper tongue. "Anyone can cook. It's just that not everyone should." Her simple wisdom is true in all walks of life: Today, watch any "talent" show on TV and you'll find plenty of contestants who would do well to follow Mrs Brown's advice in their own dream pursuit. Anyone can sing, but not everyone should. So how do you know if you should? It's not simply a case of doing something, it's doing something exceptionally well and enjoying doing it. That's an "and" not an "or". I knew that I thoroughly enjoyed cooking but it takes others to tell you if you do it exceptionally well. When you find out what that is, then you've found your talent. And everyone has something that they do exceptionally well and thoroughly enjoy doing. When I ask if you know what your talent is, you may struggle to identify it. You may not be an exceptional musician or artist, actor or even a sports person. These are the types of things we traditionally associate with the word "talent". You may think I'm referring to your job. It could be and I hope that your job does enable you to use your talent, but the chances are that you are unsure, and probably too humble to realise that you really do have talent. But I can assure you that you do. Malcolm Gladwell based his 10000 hour rule in his book Outliers on a study by Anders Ericson that it takes 10000 hours of deliberate practice to become great at something. Such 'greatness' is often confused with the "talent" that enables it. For your talent is rarely manifest as something great, usually, your talent is actually something pretty mundane. Well, at least to you it is mundane. It is something that you "just do". But where do you start on your 4-year journey to greatness? Whenever we undertake something new we start as an enthusiastic beginner. You don’t know what you don’t know as you steadily try this new thing. You make mistakes. You correct them and make more mistakes until at last, you become competent at this new thing. 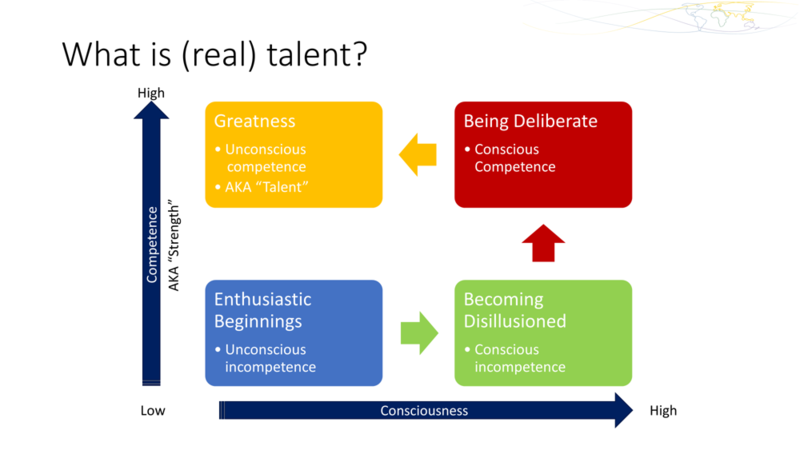 Talent is something we develop over time and become socompetentt at doing that we do it unconsciously. It greatly helps if we enjoy doing it too! After a while (perhaps 2000 hours of trial and error and practice) you realise that there's more that you don’t know than you do know. 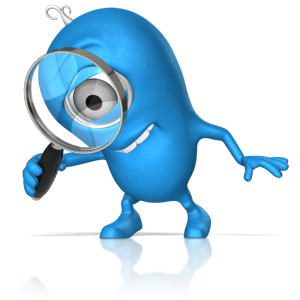 You are competent in this new activity and know that you don’t know it all yet. Many many people give up at this point. This is when discipline and disillusion crash head on. A rare few let discipline win the battle and deliberately practice through this painful period for another 2000 hours. Most people quit and chase another shiny object or simply accept that they will never be masters of this particular game. If we have continued and learned and practised after another couple thousand hours we know what we know and we are very deliberate about practice and cautious not to mess up. The enthusiasm wanes and frequently get frustrated knowing that we're just short of perfection and how much more practice will it take before this is just effortless? Perhaps another 4000 hours. For those who persevere and keep on keeping on, there comes a day when you find that greatness has happened. Everything went brilliantly with your new skill and suddenly you realise that you didn’t think about it at all. It just happened. You have practised long enough and hard enough that now, your talent is manifest in this particular skill. You've been doing this for so long now that you have forgotten how you do it. Will you still make mistakes. Of course, you will, but mistakes don’t really bother you now, you just do it again and get it right. How? You're just doing it. 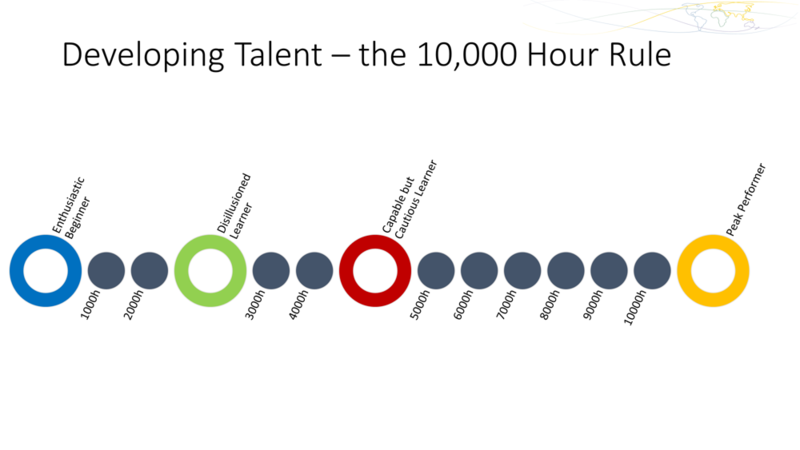 How can you shortcut the 10000-hour rule? There's a recent meta-study at Princeton that refutes the 10000 hour rule suggesting that deliberate practice makes a positive performance variance of just 26% in games and a mere one percent in professional activities. But that does not mean you can develop greatness without any practice - it has more to do with the predictability of the activities and thus if they can even be effectively measured. So how much practice do we need? 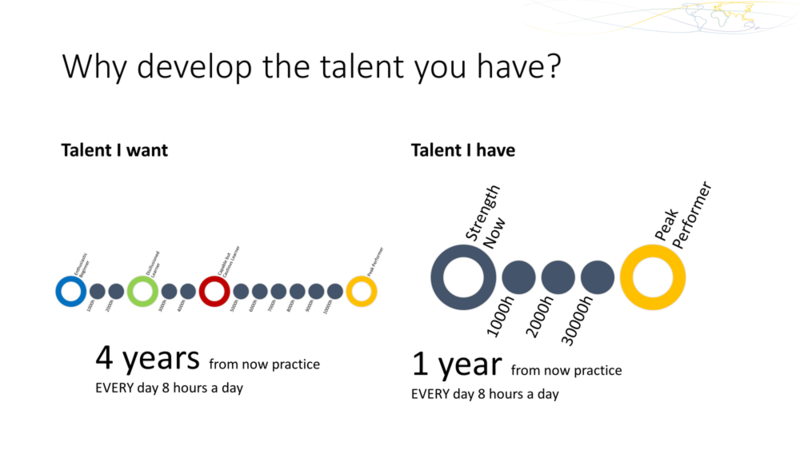 By developing the talent we already have, we can significantly reduce the time it takes us to become great at something. If you work on a 'natural' ability or great strength you already have, then surely you can significantly reduce the time you need to become great at it. But what if my 'talent' has nothing to do with my job? It may not be obvious to you at all, but if you are actually good at your job, I suspect that you are using your talent, or at least a part of the way you do your talent. And if not. Then it's about identifying your talent and leveraging this into your desired activity. 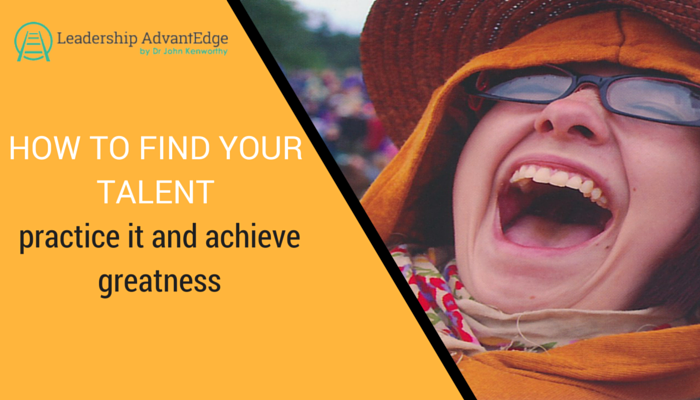 The fantastic news about finding your talent within your strengths is that your talent can be leveraged. That is, you can use your talent in another area of your work and life to add value to another area. You can also combine your talent with those of other people to add value to each other. When you leverage your talent to another area in your life, you'll then do something else exceptionally well and thoroughly enjoy doing it. When you leverage your talent with those of others, together you'll create something innovative and powerful and you'll all do it exceptionally well and thoroughly enjoy doing it. A few years after my work at the greasy spoon with Mrs Brown, I was privileged to work in the kitchen of one of England's finest and talented chefs. I won’t mention his name because whilst he was, without doubt, one of the most talented chef's in the world, he was also one of the most obnoxious, unpleasant, mean and egotistical gits I have ever had the misfortune to meet. A tiny mistake would bring the roar of shame, a second's delay could result in a slap and a split hollandaise could find a knife flying through the air intent on pinning you to the wall. I learned all I could before, like every other sous chef before me and afterwards, quitting and finding a less temperamental and much safer environment to develop my skills. It often seems to be that the greater the talent, the more ego that goes along with it. So we need to be a little different. We want to develop our talent whilst simultaneously taming our ego. Making sure that we maintain a good, respectful and positive attitude. Treating others well and listening to others with a keen understanding and empathy. We need to remain teachable and accept that just because we have talent does not make us God's gift to humankind. Remain teachable and courageous and fan the flames of your passion and deliberately doing the right thing even when would be easier to take a shortcut. Talent is rarely obvious and searching for it takes a little time and effort. If you would like to explore this together I suspect that you'll be in for a surprise. It's not that you don’t know your talent, it's that you probably don’t know that you know. That is, your talent is something unconscious. It's something you "just do". Indeed, those words are the ones I most often hear as I help them explore their talent: "I just do it." It is something that is so ingrained that you have turned a conscious process into an unconscious one, a habit if you prefer. And that habit may seem to have nothing whatsoever to do with the task in hand… apparently anyway. You see, my talent is not, as I suspect you are thinking, cooking. No, my talent is algebra. I'll explain more as we progress, but for now, let's focus on you and start a journey of self-discovery that could well cause you to do everything exceptionally well and thoroughly enjoy doing it. If you would like to find and understand your talent and how you can leverage your talent in your job, or some other part of your life, you can sign up for a special email course I have developed to help you find and leverage your talent. I'll guide you on a journey to find your STORY. It's completely free of charge for AdvantEdge VIP members. You'll receive a series of emails from me taking you through the steps. You do the work. It's not laborious work, but it will take some time and effort on your part. There are no instant solutions for you. It's not an assessment and you will write about you and your life. You don’t need to share your findings or writing with me or anyone else, but you can if you want to do so. Are you ready to uncover your talents and leverage them so that you thoroughly enjoy everything you do, and do everything well?